Pencil Revolution -- Pencil philosophy: Wooden Wisdom, Product Reviews and Ephemera etc. Syn Magazine is a pilot magazine project for synaesthetes. Synaesthesia is a sensory condition whereby the synaesthete experiences a mixing of the senses ie.a particular sound for instance a word triggers a taste. Carl Barks Complete -- the complete works of Carl Barks are now being published by Egmont in Swedish, Danish, Norwegian and German. Best Lettering : Todd Klein, Promethea; Tom Strong; Tom Strong's Terrific Tales (ABC); Wonder Woman (DC); Books of Magick: Life During Wartime; Fables; WE3 (Vertigo/DC); Creatures of the Night (Dark Horse). ¶Read about all the 2005 Eisner Recipients at comic-con.org. The awards were presented on the evening of Friday, July 15, at the San Diego Convention Center as part of Will Eisner Comic Industry Awards ceremony. »Grannarna.se -- Local Classifieds, Stockholm, Sweden. Agfa-Photo declares insolvency -- the news is old, but I didn't know. Read the article at Forbes.com 27.May.2005. 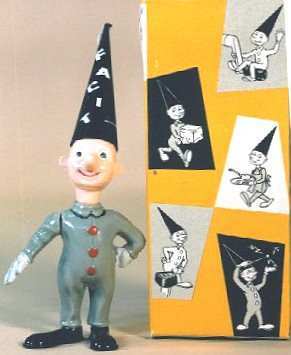 I found this Facit Doll via google images but the site officemachinemanuals.com was 'Not Found'. Die Welt rechnet mit FACIT -- The Cartoonist posted this old Facit ad in his blog yesterday. »Search eBay for FACIT collectibles. »Search eBay for vintage Facit, typewriters, calculators and advertising collectibles.